Cleaning is an important part of every business but in an industrial setting it’s an absolute necessity. With cleaning supplies from Brown Engineering, your facility can look its best while staying safe at all times. From the hand wipes to industrial strength degreasers, Brown offers its own line of cleaning products, Brown’s Busters, to help keep you and your workplace clean, polished, and germ-free. We also carry the SprayOn line of aerosol cleaners and degreasers as well as a complete line of absorbents for the inevitable leaks and spills. 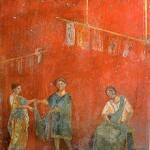 Fun Fact: The ancient Romans used ammonia (derived from urine) and fuller’s earth to launder their woolen togas. Fullonicae (the laundries) were very prominent industrial facilities, with at least one in every town of any notability, and frequently the largest employer in a district. These laundries obtained urine from farm animals, or from special pots situated at public latrines. The industry was so profitable that fullers’ guilds were an important political constituency, and the government taxed the collection of urine. Gentle but tough….sounds like an oxymoron, right? Well our Grime Grabbers are just that. These tear- resistant hand wipes eliminate the need for water or towels and come in convenient canisters so you can just grab one and keep on going. Grime Grabbers are soaked in hand cleaner with a clean citrus fragrance and remove grease, tar, ink, and many other hard to remove soils that build up on your hands throughout the day in an industrial environment. While they clean, they condition hands with glycerin, aloe vera, jojoba, vitamin E and wheat germ extract so they won’t cause your skin to dry out and crack. 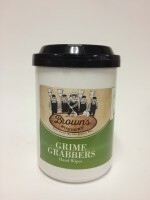 Grime Grabbers are also terrific for wiping down non-porous surfaces like tools, small parts, countertops, work vehicles, or even your desk. These heavy duty wipes suspend and absorbs soils from your hands and other surfaces for easy removal. Always a big hit, our industrial strength drain opener, Block Buster, dissolves everything clogging your drains including grease buildup, hair, starches, fats, oils, vegetable gums other organic wastes, and small particles! It’s non-acid and non-fuming, and safe for use on all plumbing fixtures, septic tanks, garbage disposals, and porcelain. Block Buster pours through standing water, so clogged drains do not have to be emptied first. Every industrial maintenance mechanic can use a helping hand from time to time. 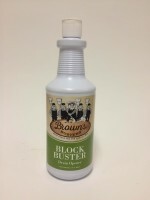 So, Brown’s Busters Helping Hands Soap has the fresh scent of natural citrus with pumice added to remove all the evidence of a hard day’s work. This citrus-based formula is pH-balanced, very effective at cleaning tough soils, biodegradable and petroleum solvent free to address environmental concerns. Premium, natural citrus cleansing agents safely and effectively dissolve grease, paints, inks, and many other hard to remove soils. 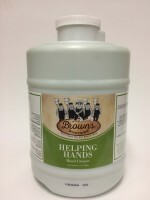 Helping Hands is fortified with five conditioners including glycerin, jojoba, aloe vera, vitamin E, and wheat germ extract to help keep hands soft and smooth. It comes in containers that fit right into a dispenser for ultimate ease of use. Step safely onto your factory floors with Brown’s Busters Safety Step. This highly concentrated general purpose cleaner was designed to cut through the toughest soil conditions, and leave surfaces sparkling clean with a fresh pleasant citrus scent (especially floors). It also contains an effective buffering agent for effective cleaning power under heavy soil loads. Safety Step contains HydroSolv 2000 technology, a fast acting powerful solubilizing agent that dissolves and suspends any soil, allowing it to be wiped or rinsed away completely. Available in 55 Gallon Drums. Shop Shine is a ready to use, fast-acting, heavy-duty cleaner formulated to clean all washable surfaces in your shop and make them shine! Our non-abrasive formula penetrates and removes the most stubborn stains and leaves surfaces sparkling clean. Shop Shine is free of harsh fumes, and leaves surfaces with a fresh citrus scent. Available in 55 Gallon Drums. Learn more about Sprayon® Industrial Cleaners & Degreasers which deliver industrial cleaning strength for your toughest applications, by watching this video. From light duty clean up jobs to all-purpose, floor-cleaners, and power washers to heavy grease build-up, there is a Sprayon Cleaner or Degreaser that will make your job easier and they’re all available through Brown Engineering!